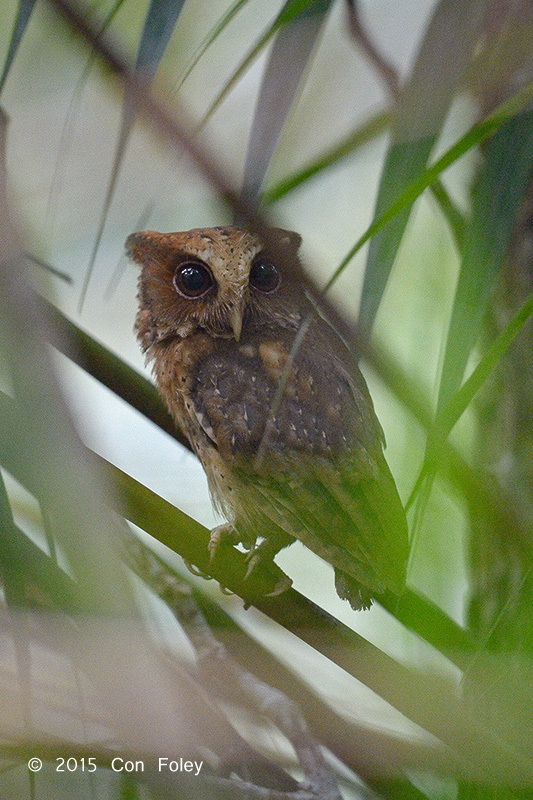 Ranging from peninsular Malaysia and just across the border into southern Thailand, skipping over to Sumatra, and then onto western Java and Borneo, the Reddish Scops Owl is primarily a lowland rainforest bird with some records to a few hundred meters. The lowland rainforest is under continual threat of deforestation, but because the range is very large this bird is rated Near Threatened. Traditionally birders might head to Way Kambas in south Sumatra which has a good reputation for nightbirds, and Reddish is one you can get there. There are also several sites in Borneo especially in Sabah. In peninsular Malaysia it would seem that Taman Negara is the go to site with additional possibilities in Kedah. Besides visiting all the time honored sites or having a guide take you to see one, they do exist further south in Johor. I heard my first Reddish in 2013, twice within a week at the same spot. And then again in 2015 at a new location. Finally on the fourth time hearing the bird I got to see it. As happens so often in birding: no effort, no reward. And what a reward it is! For me the Reddish Scops Owl is the cutest of the resident scops owls; and it’s just a pint-sized bird. What follows is a mini-guide on how to find one for yourself. Since two locations were found in Johor, certainly many more locations can be found. I am happy to share techniques. Most field guides only give you range, habitat and ID features, but usually no tips on how to find the bird. First there is no shortcut, you have to put the time in the field in the predawn or post dusk darkness, and listen for the call. This owl seems to prefer mainly plains level lowland rainforest, and appears to need relatively undisturbed habitat. So you have to visit good quality habitat. Birds which call in the predawn darkness often do so in a progressive fashion, with some birds calling earlier than others, and then as dawn approaches, others joining in chorus. Typically the Sunda Scops Owl will be calling quite early in the predawn darkness. The Gould’s Frogmouth will also call early. Then the Brown Hawk Owl starts calling as first light of day can barely be seen. And so does the Blyth’s Frogmouth. Around this time the Reddish Scops Owl will usually be calling (if its around and in the mood), and with luck you may hear them calling until 30 minutes or more after dawn. This might allow you to find one on a day roost. And if you are lucky enough to find one on a day roost, it will be there all day. 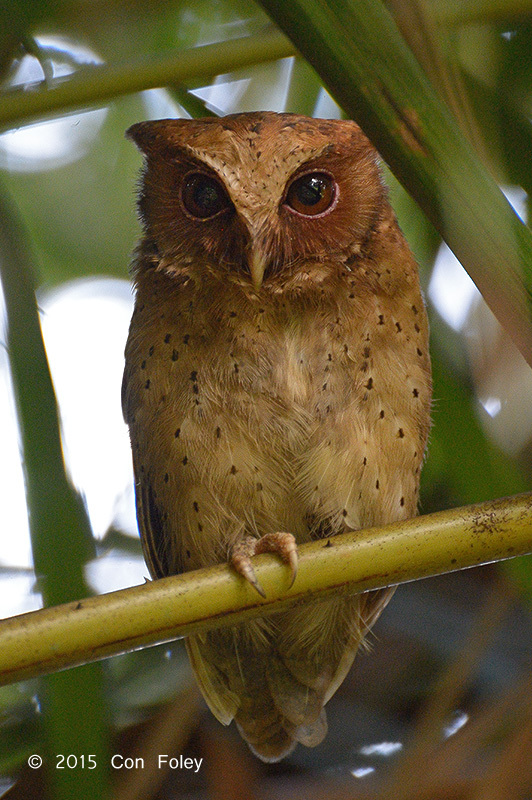 It turns out this bird likes to perch and roost in palms, just as the Sunda Scops Owl does in Singapore. I’m sure given the wide range of this bird it has adapted to other roosts that offer concealment, tangled vines and so forth. This bird will perch anywhere from just 1 or 2 feet above ground on a low palm branch up to perhaps 8 or 10 feet. So it’s quite a low perching bird. But it can be difficult to spot while hidden in the dense palm. With care you can get quite close especially after dawn while it is roosting, its instinct tells it that it can’t be seen. There are only seven images on the Oriental Image Database as of the date of this post, and all of them done with flash photography, none on day roosts. So I guess the daylight photos in this post may be a bit uncommon. Enjoy!